With a review of some recently published CD-ROMs we would like to help NDT conference organizers identify what important features should be recognized when designing a conference CD-ROM. To better illustrate these points we have used the recent 8th ECNDT CD-ROM  and some other as an example. CD-ROM design of conference proceedings needs other and more complicate criteria than a printed proceedings. The complete conference process, starting with call for papers, must consider a suitable and compatible data management for the CD-ROM development. That means that in an early stage a concept of the CD-ROM must be in many details clearly enough, otherwise the work can get very time consuming. A CD-ROM should work with Java compatible Internet Browsers like MSIE. A customized tool bar must not provided. There are pro and cons to customized tool bars but we also have not used customized tool bars for CD-ROMs we had so far designed [2,3,4,5]. For someone, who is familiar with Internet browsing, it is not a problem to use this interface. The 8th ECNDT CD-ROM (Fig 1) works with this Interface without a customized toolbar. Some small DGZfP conference CD-ROMs  using an Adobe Acrobate Viewer with advanced navigation features - an acceptable low-cost design. An example of a not user friendly design is the Seville CD-ROM (Fig 2) . About 150 papers have been packed in 9 big Session files totalling 157 MB. These can be browsed with Adobe Acrobat Reader. Unfortunately features like Navigation, Search or Author Index were not provided for this CD ROM, but the box with its cover picture is nice! The complete contents should be provided as Internet HTML-Format like the WCNDT 2000, APCNDT 2001, DGZFP 2001 and DGZfP 2002 CD-ROMs [2,3,4,5]. 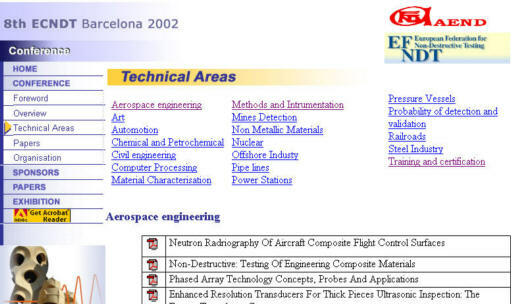 The 8th ECNDT CD-ROM used only for the main pages this format, but all papers are provided as Adobe Acrobat format (PDF). This may be seen as an pseudo Internet compatible format, however for the use on the Internet the files are usually to big. For example, we provided the paper no. 15 with 135 KB as HTML file while the same paper on the CD-ROM is 2129 KB. Also most of the Internet search engines do not recognize PDF format. Publishing conference proceedings on the Internet is widely desired by many potential users. If the materials are large and time-consuming or difficult to download, the author's paper may not get the full attention of the potential readers. One of the most important function of a CD-ROM is the search. Without this tool, conventional published printed proceedings could be much more convenient to browse than a CD-ROM. Two search strategies should be available, first a full-text search for retrieving all papers' content and second a search on hand a list of controlled descriptors that NDT professionals have edited for each paper. Usually 5 descriptors for each paper are enough terms to describe the area of methods and applications. Authors free keywords can be a help for the editors but cannot be just copied for use as a descriptor search. All descriptors must recognize the same pool of terms (thesaurus) which only an editor can control. Besides these descriptors a list of author and co-author names as well as countries should be available. Good examples of this search strategy can be found in the CD-ROMs designed by NDT.net [2,3,4,5]. Please take in account that the Search of the CD-ROM contents provided at the Internet must execute another search program than this of the real CD-ROM, however, the results are in principle equal. 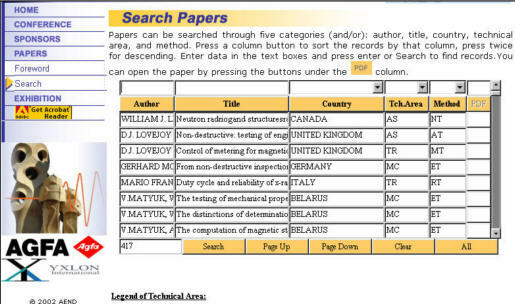 The 8th ECNDT CD-ROM provides a search through five categories: author, title, country, technical area (only one term), and method (only one term), see Fig 3 and details in Fig 4. The more important full-text search is not available. Without a full-text search the user relies completely on the editor's chosen category! Table 1 shows examples that categories which are used from the conference session are often not clear enough and sometimes even wrong. Also it shows that one descriptor for the technical area is usually not enough. Categories like author can be sorted by A-Z but the sort function recognizes the given name and not the family name. For example, A. CHERNYSHEV is the first name of the list (Fig 4). Also no co-authors are listed by this method. Another problem is the use of accent letters. Unless the user's keyboard is configured to use all of the potential variations on accented letters the Search capabilities may be limited. The search matrix height of 8 rows is too small. As well the column's width is so small that only the first 9 characters of the author field and 33 characters of the title field are visible. The matrix data viewed by the user should be large enough to provide the user with enough information to assess the results. After the user performs a search or has sorted the list and then comes back from the paper to the search page, the previous search is deleted. This is inappropriate treatment of the search criteria data as the user may want to assess other papers based on the same search results and constantly re-entering the same information would be tedious. The abbreviations used for the NDT methods are not explained but are more or less clear, however we wonder if AT means AE. More difficult to understand is what NDT method "ST" is intended to abbreviate. The abbreviations for the technical areas (applications) are explained at the bottom of the page, but are very difficult to get in mind. It would be much better to see the full name, e.g. instead of "PL" to see clearly "Pipelines". Additional to a search a table of contents should be provided by Technical Areas. Unfortunately the 8th ECNDT listed all papers only with title but no author names and institution. The CD-ROM design of NDT conference proceedings is not just a matter of multimedia experiences moreover knowledge how to present NDT literature is important. A specification and a test phase may help. However, a specification which shall cover all circumstances that may occur during the design is difficult to write. To make corrections after a test phase at the end of the design is expensive and a usually a tight time schedule does not allow a delay due to redesign work. The selection of a company which can show references of similar CD-ROMs may be the best insurance to get good results. 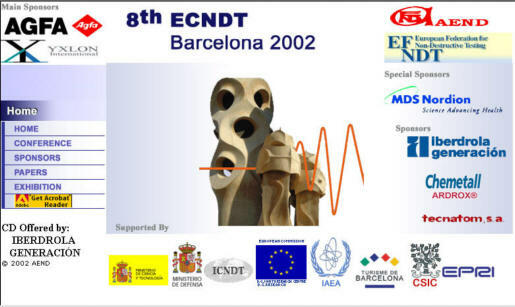 If you have enough time to search, the 8th ECNDT CD-ROM is worthwhile to order via the Spanish Society for NDT (AEND) .